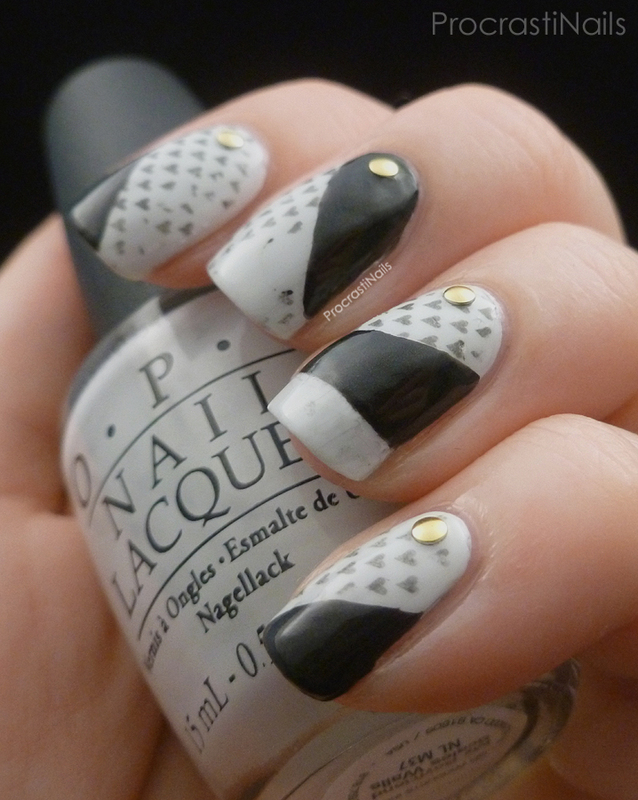 I picked up a package of Essence Nail Art Trend Paper Print Manicure (aka printed designs for newspaper nails) and Essence Transfer Solution last year and decided that if ever there was a time to give it a try it was for a Black & White Nails challenge fill. 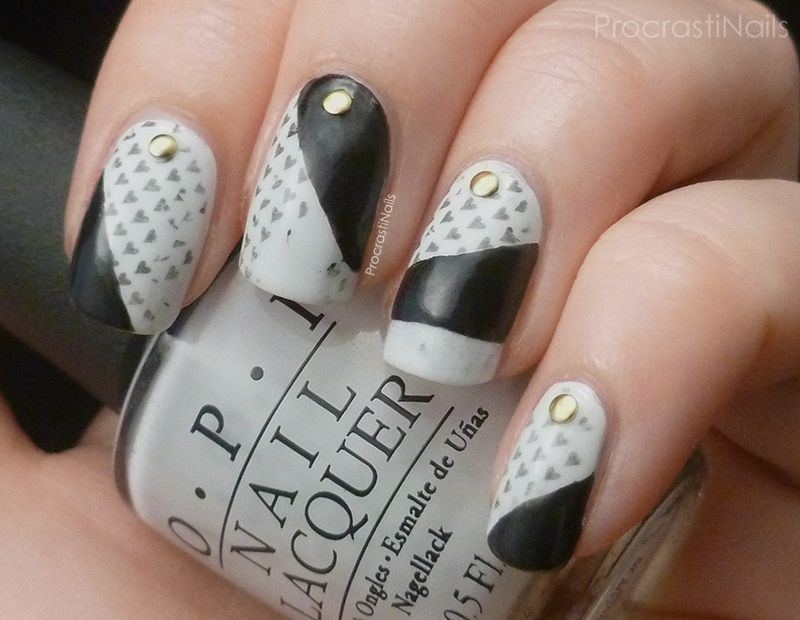 Throw on some free handed colour blocking and some studs and we've got ourselves a manicure! This was my first time using this product and it worked pretty well. It's basically a similar process to using regular newspaper and alcohol, except the package comes with 6 different prints (some black and white, some full colour). You cut a piece to fit your nail, brush a generous amount of Essence Transfer Solution directly to the paper, and then press the soaked paper firmly on the nail with a cotton ball for 15 seconds. As you can see the design came out a bit scattered in terms of coverage. My base is OPI My Boyfriend Scales Walls and once the print was dry I did some random, free handed colour blocking with OPI 4 In The Morning and then added some gold studs. Cover the whole thing with a layer of top coat and you're ready to go! So there we go, one more day done! Thanks for visiting! Nice print and I like the color blocking happening too. Perfect for day 7! I'm loving the heart print! The hearts came out amazing! This is a way cute mani! It's cute! I haven't tried newspaper print yet this reminds me about trying it! The studs are a nice touch! I've never tried newspaper nails before, but it is a really nice effect. I really like how it looks with My Boyfriend Scales Walls. I want to try that polish soon! This looks so cool! I love how you added the colorblocking and the studs finish the whole look off nicely. I've never heard of these transfer sheets before but what a neat idea! Your nails look great!! I love how it turned out on your nails! 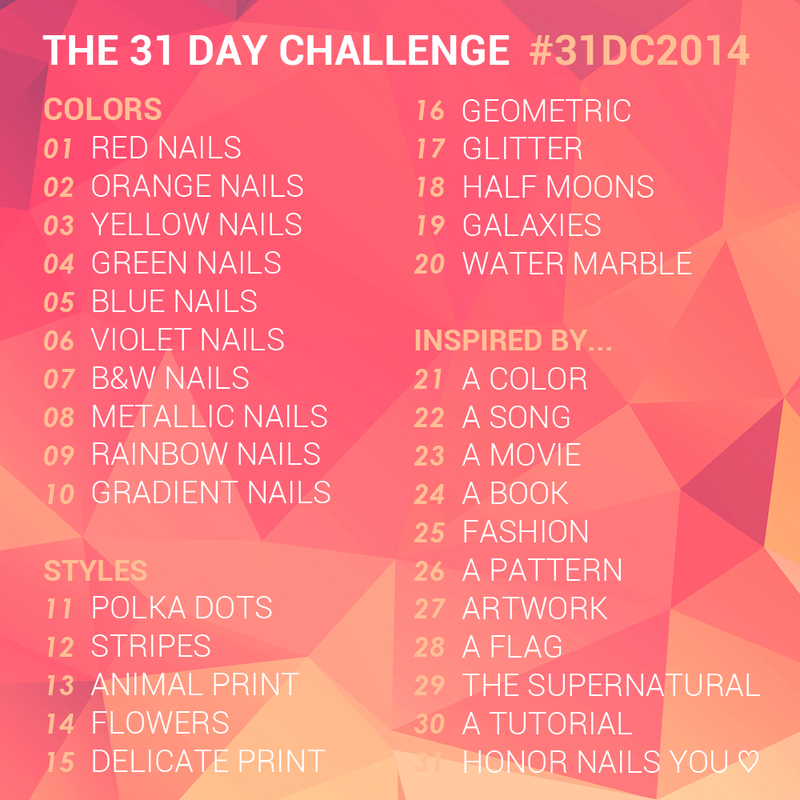 I tried this paper print product once and could just not get it to work :S I must try again, cause your mani is cool!